We are all familiar with the traditional movie theatre layout, but architects and designers are continuously pushing the boundaries of cinema design. Here are a couple of unique and rather amazing cinema design and architecture examples. Cinema Pasaka in Vilnius, Lithuania is a two-screen art house that has sparked the imagination of eco-enthusiasts. Cyclists who love movies can promote an ecologically friendly lifestyle at this unusual bike-powered cinema. Eight volunteers at a time use pedal power to spin the generator-connected wheels that power the cinema’s projector. This unorthodox approach takes just 30 minutes to set up. 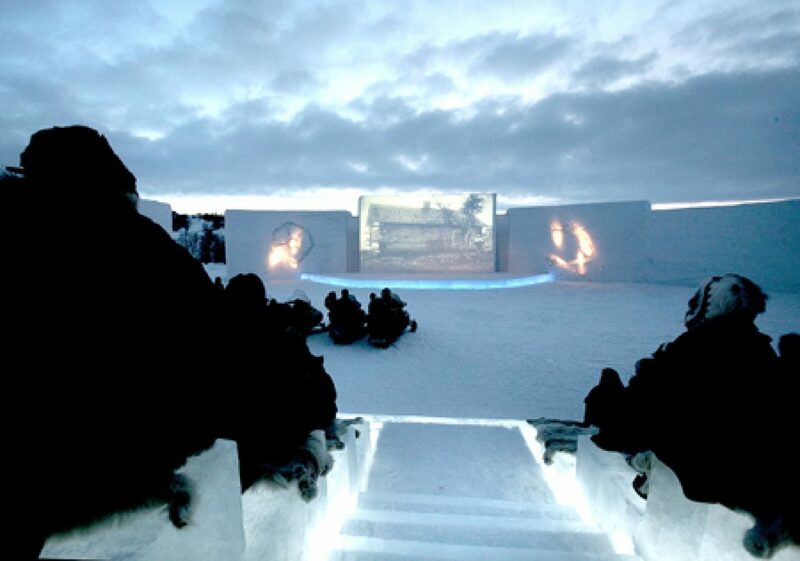 Norway’s Sámi International Film Festival, Guovdageaidnu is home to the Isbio “ice cinema”. Normal cinema seats and drive-in spaces are available. However, what makes this cinema truly unique is the fact that there are drive-in spaces for ice scooters, snowmobiles, and even reindeer sleds. Audiences are advised to bring sleeping bags and warm clothing. A wise move, as this region is inside the Arctic Circle! The Isbio has its own ice bar, where spirits are served in ice glasses. Due to the ‘frozen’ nature of the cinema, digital video is often used instead of more traditional formats, and the temporary ice architecture is different each year. The Isbio also features a cinema screen made from pure ice and snow from the near-by Kautokeino River. There are also projects in other parts of the world that are equally wonderful. Renowned for its progressive culture, the Netherlands is home to the groundbreaking Multi Mill project in Amsterdam. This waterfront “cultural stage” or “multifunctioneel cultuurpodium” has been compared to a merry-go-round, turntable and windmill. The moveable, flexible base is designed to accommodate a wide range of art forms, from film and dance, to fashion and sculpture. Do you know of any other weird, wacky or wonderful cinemas? Making Digital Signage Technology Come to Life →← Welcoming Mobile Phones into Cinemas – Yay or Nay?